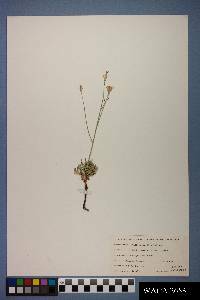 Perennials, 20-50 cm (rhizomes slender). Stems single. branches on distal 1/3-1/2, glabrous or sparsely puberulent. Leaves green at flowering (at least on plants of spring and early summer, frequently absent in plants of late summer); basal blades oblanceolate to spatulate, runcinate, 4-7 cm, margins pinnately lobed (faces glabrous or sparsely puberulent). 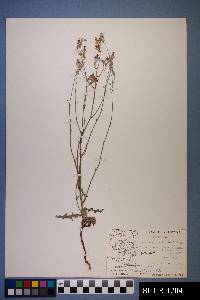 cauline reduced, scalelike on plants of spring and early summer, linear and threadlike (to 3 cm) on plants of late summer. Heads borne singly on branch tips. Peduncles mostly 5-100+ mm (bracteolate). Calyculi of (4-6) appressed bractlets (unequal, lengths to 1/2 phyllaries). Involucres 9-11(-12) mm (phyllaries 6-8, glabrous). Florets 10-16(-20). Cypselae tan, 5-6 mm, faces smooth, grooved; pappi of 30-40, white bristles (persistent), wholly plumose. 2n = 16. Flowering May-Sep. Open, sandy sites in juniper-mesquite grasslands and in yellow pine forests, sometimes growing as weed along roadsides; 1200-2500 m; Ariz., N.Mex. Tex. ; Mexico (Sonora). 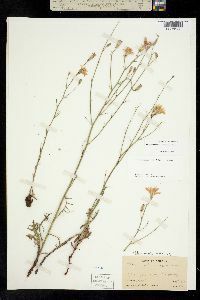 Stephanomeria thurberi has been collected most often in May, June, and early July. 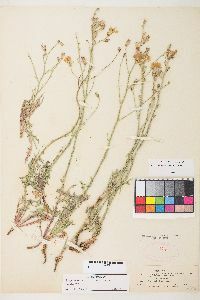 These specimens have well developed basal rosettes, stems with nodes 3+ cm apart, relatively short branches, usually only on the distal 30-50%, and scalelike, cauline leaves. That is the form described by Gray. 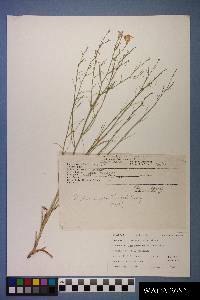 Another form has been collected from late July into early September that is morphologically distinct, as first pointed out by A. S. Tomb on the labels of specimens he collected in 1968 and 1970 (see below). That 'summer form' lacks basal rosettes, the stems have more numerous nodes, about 1 per cm, beginning at ground level, and threadlike cauline leaves 3-4 cm. Those specimens usually have relatively few heads. 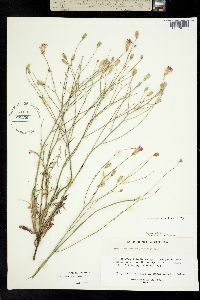 Some specimens collected in July are intermediate, having basal rosettes and relatively long, threadlike cauline leaves, or no rosettes and relatively short, scalelike cauline leaves. It is not known if the different growth forms represent distinct genotypes that initiate growth at different times, or if the same individual produces aboveground parts with differing appearances during the growth season. It is also not known if the two forms commonly grow together as they do in Coconino County, Arizona (Tomb 280, August 10, 1968, and Tomb 631, June 12, 1970), or if they generally occupy different habitats. The unusual situation calls for study.